This is Kagurazaka, an area of Tokyo where both the Edo period and the present are part of everyday life, and an area that has some back streets that only local cats are experts on. If you like history and photography, this is an ideal spot. This is Kagurazaka, an area in Tokyo that, despite having modern urbanized parts to it, still maintains its original Edo period charm. In fact, one of the major draws of this neighborhood is the continued and harmonious coexistence of the past and present. The slope that leads from JR Iidabashi Station, which is where the outer moat of the former Edo castle was located, to Okubo Street - this is the Kagurazaka area. Okubo Street is called Kagurazakaue (the 'top of Kagurazaka'). Just step into any side street here, and you'll find traces of the Edo period, such as stone paved alleys and traditional Japanese restaurants called ryotei, still remain. However, the charms of Kagurazaka don't completely end on the other side of the hill. If you continue even further along Kagurazakaue, you'll find Kagurazaka Station, on the Tokyo Metro line, which also has an old Japanese downtown-like atmosphere to it. Let's wander the streets around Kagurazaka Station and see what it's like! From the top of the hill, let’s walk towards Kagurazaka Station. The tone of the area here also matches that of the station. There are many small shops built in very similar styles here; these shops are modeled after or built in kominka, a type of traditional old home. Each shop is unique in its own way, and offers a comfortable warmth that will surely make you want to spend time leisurely shopping in this area. This is a good place to go if you're looking for souvenirs or just want to take a break from walking about. This cafe pictured above is also quite attractive - you might be tempted to stop here, even if you've just left another cafe! The comfortable atmosphere of this area is something that you might not even find on the main part of Kagurazaka. As you get closer to Kagurazaka Station, you will come to Akagi Shrine. The main building of this Shinto shrine, has a very modern feeling to it, as it is made almost entirely out of glass. In fact, Akagi Shrine was completely redesigned by famed Japanese architect, Kengo Kuma. Despite the number of shops that operate along Kagurazaka, the stylish exterior of Akagi Shrine is sure to catch your attention. In fact, right next to this shrine stands a very modern and chic apartment building. This designer apartment complex also fits exceptionally well into the atmosphere of the area - you can truly appreciate the combination of the past and present in Kagurazaka! Not only that, there’s also a cafe at this shrine. This unique collaboration of having a cafe at a shrine is something that could only exist in Kagurazaka. You can feel the draw of this shrine and its connection to everyday life here very clearly. Now let's take a stroll into the residential area near Akagi Shrine. While you won't find the stone paved alleys and restaurants of Kagurazaka here, you will still find traces of an Edo period downtown in this area too. Pictured above is a gentle hill known as Akagizaka. When descending this hill the atmosphere of the area changes yet again; it stretches out and becomes a residential neighborhood brimming with life right in front of you. There is a rabbit warren of roads here, some that are so narrow only a single (sometimes compact) car can safely travel along them - this is what the streets of old Japan were like. These traditional neighborhoods and the many lives and lifestyles that have existed in them tint the very streets themselves, which gives the entirety of Kagurazaka and Akagizaka an atmosphere you just can’t experience anywhere else. While walking around you’ll see plenty of cats all over the place too. 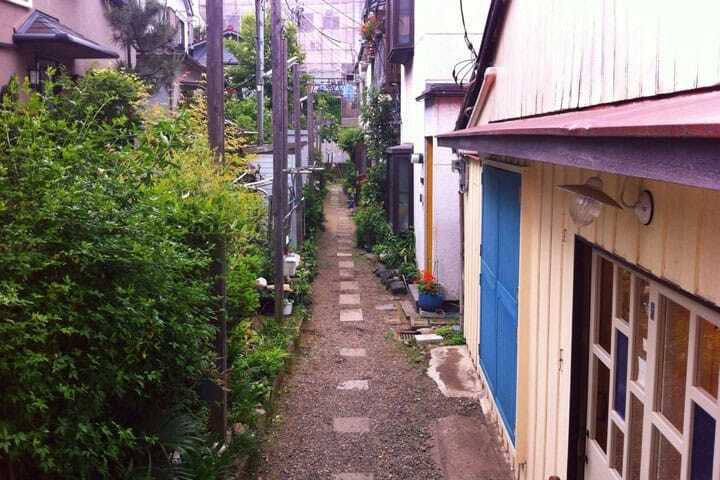 The Kagurazaka area is full of city cats - so much so that the Japanese author of this article said they'd like to be reincarnated as a cat and live on the streets here so they could play in the back alleys. This is Kagurazaka, an area where you explore at a leisurely pace and make new discoveries no matter how many times you visit it. And if you get tired from your adventures, you can pop into one of the many chic cafes here for a break too. Come for a stroll in Kagurazaka and see the Edo and modern mix of this neighborhood for yourself. Encounter Samurai And Ninjas At Nikko's EDO WONDERLAND!